Context: We investigate the nature and classification of PMN J1603−4904, a bright radio source close to the Galactic plane, which is associated with one of the brightest hard-spectrum γ-ray sources detected by Fermi/LAT. It has previously been classified as a low-peaked BL Lac object based on its broadband emission and the absence of optical emission lines. Optical measurements, however, suffer strongly from extinction and the absence of pronounced short-time γ-ray variability over years of monitoring is unusual for a blazar. 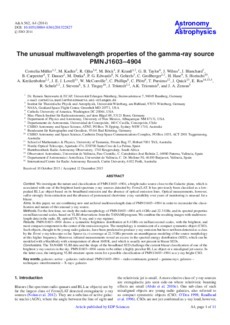 Aims: In this paper, we are combining new and archival multiwavelength data of PMN J1603−4904 in order to reconsider the classification and nature of this unusual γ-ray source. Methods. For the first time, we study the radio morphology of PMN J1603−4904 at 8.4 GHz and 22.3 GHz, and its spectral properties on milliarcsecond scales, based on VLBI observations from the TANAMI program. We combine the resulting images with multiwavelength data in the radio, IR, optical/UV, X-ray, and γ-ray regimes. Results: PMN J1603−4904 shows a symmetric brightness distribution at 8.4 GHz on milliarcsecond scales, with the brightest, and most compact component in the center of the emission region. The morphology is reminiscent of a compact symmetric object (CSO). Such objects, thought to be young radio galaxies, have been predicted to produce γ-ray emission but have not been detected as a class by the Fermi γ-ray telescope so far. Sparse (u,v)-coverage at 22.3 GHz prevents an unambiguous modeling of the source morphology at this higher frequency. Moreover, infrared measurements reveal an excess in the spectral energy distribution (SED), which can be modeled with a blackbody with a temperature of about 1600 K, and which is usually not present in blazar SEDs. Conclusions: The TANAMI VLBI data and the shape of the broadband SED challenge the current blazar classification of one of the brightest γ-ray sources in the sky. PMN J1603−4904 seems to be either a highly peculiar BL Lac object or a misaligned jet source. In the latter case, the intriguing VLBI structure opens room for a possible classification of PMN J1603−4904 as a γ-ray bright CSO.